"Picture It" picture book giveaway. Toronto hosted Word on the Street on Sunday. I'm always blown away by the sheer number of people who come out to the one-day festival. There are kids' literature lovers, fantasy and sci-fi afficiandoes, magazines, alt literature - even Harlequin had a booth. I picked up some fantastic ideas for kids' literacy. One of the best was a brand-new series of books called "Picture It picture books." They're the brainchild of Leanne Milech and Alicia Belvedere. 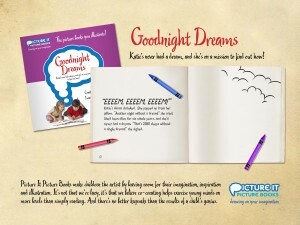 They're picture books with text on each page, with a big blank space for kids to illustrate them themselves. So for instance, a page will say "I have many toys, but this one is very special to me." And then room above for the child to draw their special toy. It's a brilliant idea, because some kids are more into art than words. This draws them into the language as they explore their artistic side. There are six books so far. "Goodnight Dreams" is about a girl who doesn't dream and sets out to discover why. "Captain Zane" takes kids on a sea adventure. There's also an alphabet book and a number book as well as a book about the child and their family. The women have sold their idea to Chapters Indigo so it's certain to take off. It's also been featured on TV on CityLine. Here's the Picture It website with more information. Getting Kids Reading is proud to be giving a series of these wonderful books away to one lucky GKR reader. I'll be doing a random draw, selecting one name to win. The books are for kids 6 and up, although I'm sure that younger kids would enjoy them too. They're listed at $7.99 each. To enter the draw, write a Comment with your name and e-mail address. I'll put all the names in a hat and pick a winner! The winner will be notified on Tuesday, October 12. (If I haven't had enough entrants by then I might extend the deadline a bit, but let's see what happens.) Good luck! These sound fantastic for my son! This looks like a very neat series. I would like to enter the contest. These books TOTALLY ROCK! A great combinantion of language skills and imagination; and a great keepsake for the parents too! I saw this online and thought it would be a fantastic creative outlet tool for my son with Asperger's. Planning on ordering them online. awww man... I just found your site and Im not in the Toronto area... But if you are still hosting the contest please let me know. My six year old loves to read and write. While her class mates are on level 12 in the first grade, she is exceling at level 40 in reading. I am constantly encouraging her and supporting her to read, especially since she loves it!! So if anything else comes up my email addy is yolandadevon@live.com . Thank you~ Have a blessed day! Thanks everyone, for entering! Our contest is now closed and the winner has been notified. However, because I can't bear to see anyone go away empty-handed, I went back to PictureIt and asked them if they'd be able to offer our non-winning entrants a little something-something. And they did! Please check Getting Kids Reading for the name of our winner, and to find out what PictureIt is offering the people who entered but didn't win.